In the 52nd season of classical plays at the Greek Theatre in Syracuse, the stage is once again dedicated to women. The plays this year are Sophocles’ Electra and Euripides’ Alcestis,1 directed, respectively, by Gabriele Lavia2 and Cesare Lievi.3 One of the many themes of these two tragedies is the oikos, in the broader meaning of the Greek word: both family and family property. In both texts, the vicissitudes of the protagonists are not limited to their personal sphere, but involve the entire family universe to which they belong. Electra’s desire for vengeance, while she spasmodically awaits the return of her brother Orestes, goes beyond her wish to avenge the death of Agamemnon at the hands of Clytemnestra and Aegisthus: it is also aimed at restoring hereditary right, a purpose that entails gaining possession of her father’s assets. Orestes shares this objective, as evidenced by the prayer the young man directs to the gods as he enters the stage: “Send me not dishonoured from the land, but grant that I may rule over my possessions, and restore my house!” (vv. 71­­­–72). In Alcestis, the queen’s choice to offer her life to Thanatos in exchange for her husband Admetus’s is not purely emotional, a simple act of love: it entails specific consequences for the royal house and the land it rules, a land thus rescued from the institutional void caused by the king’s death. In the 2016 theatrical productions, however, these themes remain in the background. The common denominator for both directors seems to be the focus on the emotions of sorrow and bereavement. In Electra, Federica Di Martino plays the protagonist with monotonous exaggeration, running across the stage in a posture bent by hate and despair, the emotions consuming her youth while she waits for Orestes. 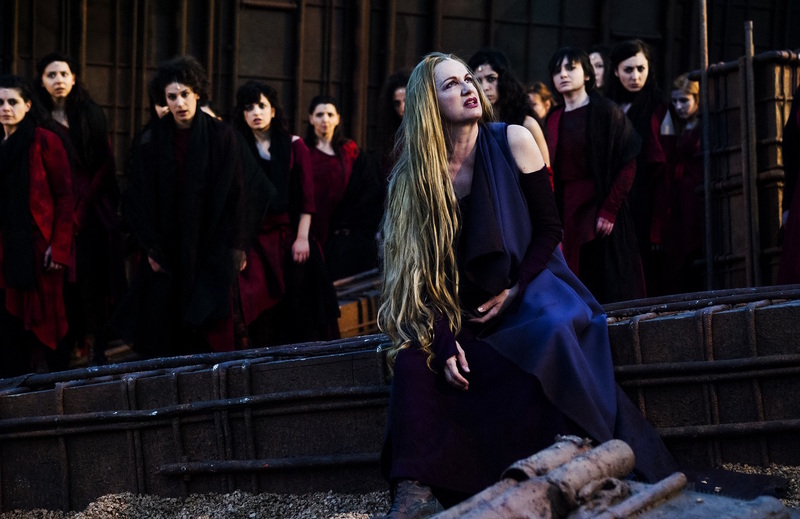 Constantly screaming out her sorrow, covered in rags and with her hair cut short in mourning (unlike all the other characters, whose flowing tribal hairdos and ahistorical costumes “tell of a world where rules are unhinged,” in the words of costume designer Andrea Viotti), Electra is a counterpoint to her mother Clytemnestra (in Maddalena Crippa’s authoritative interpretation), who is as regal in her appearance and demeanour as she is merciless towards her daughter, though she too is tormented by the thought of Orestes’ possible revenge. Electra finds no more comfort in the meek words of the Chorus and of her sister Chrysothemis, who attempt to induce her to moderation. Although the Sophoclean heroine is monolithic and moved by unshakable determination to achieve vengeance, her attitude is variously adjusted to the people with whom she interacts, and to the unfolding of events. All this is lacking in the 2016 staging, which is suffocated by exaggerated interpretive paroxysms. In Sophocles’ work, Electra is not actually driven mad by sorrow: she has her mind lucidly set on her objective. Throughout the tragedy, she repeatedly stresses that her current condition is that of a slave, and that she is forced to live miserably in her own house. She has a strong aspiration to regain the role that is hers by birthright. She lucidly explains her reasons to her sister Chrysothemis, attempting to persuade her to act in their interest, after they receive the news of Orestes’s alleged death (947–989). Maddalena Crippa plays Clytemnestra with more subtlety, despite some imperfections, managing to convey her inner torment, the state of being torn between hate and fear. The queen is violent and aggressive towards Electra, who deprives her of her peace with constant death threats. At the same time, she is also tormented by fear that Orestes may return to Mycenae to kill her. The prayer she directs to Apollo, with the secret hope that her son may die and thus free her from her impending nightmare, is a sensitive exploration of the meanders of a troubled psyche. After the deception that lets the avengers into the palace, the production rushes hastily towards the katastrophé. Orestes’s character seems faded and flat because of the systematic cutting of important lines (such as in the prologue and the dialogue with Electra) that butchers Nicola Crocetti’s sensitive translation. In its attempt to speed up and simplify the tragedy, Lavia’s “theatrical revision and adaptation” ultimately impoverishes the text. Thus when Clytemnestra is killed behind the scenes, the director cuts Electra’s ferocious lines, relying instead on the sombre tones of Giordano Corapi’s music. At the very point where the violence of Sophocles’ Electra explodes in words of uncontrollable hate (“Smite, if thou canst, once more!” v. 1415), Lavia inexplicably opts for a wordless protagonist. 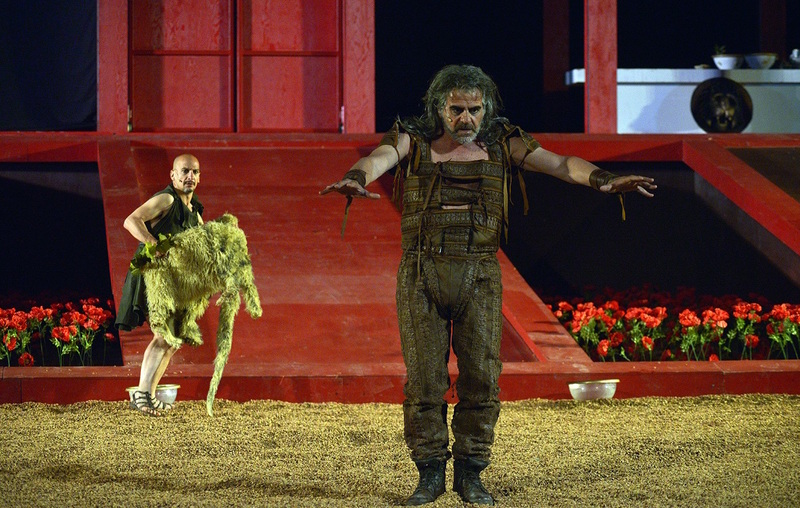 The last character on the stage is Aegisthus, interpreted by Maurizio Donadoni with flashes of vulgar coarseness. He arrives singing to himself ironically, scornful and violent, and grabs Electra by the throat and spits on her, revealing his nature as a merciless and arrogant despot. His death puts an end to the tyranny of the usurpers. The smallness of the avengers, however, dims the prospect of any rebirth for the city and kingdom: moral decadence (visually rendered by Alessandro Camera’s stage settings, with the image of a palace in ruins, iron-like and rusty, besieged by decaying rubbish) is destined to perpetuate itself. The background setting for Alcestis is instead the geometric facade of Admetus’s palace, rendered with dark red window frames and black curtains. This set creates a dialectic relationship with the archaeological context of the Greek theatre in Syracuse. When the curtains open, they give the audience glimpses of the white rooms within, so that the actions recounted by characters outside often seem to be enacted simultaneously inside, with a dynamic and immersive effect. All around, 1,400 red poppies evoke the cult of the dead. Refined chromatic effects add meaning to the characters. The black cloak of Thanatos contrasts with the bright yellow of the garments worn by Apollo, the god of light. Alcestis wears a simple white dress, as immaculate as her sacrifice, while Admetus’s costume, in shades of bright blue and held together by strings, is an allusion to his inner complexity. The dull red worn by the old king Pheres is a symbol of past power, contrasting with the female servant’s bright red, synonymous with loyalty. The production opens with a Mediterranean funeral. A band, priests, men and women dressed for mourning in a procession after the coffin: this spectacle introduces the theme of death in its timeless relevance, and should, according to the director, signal the gap between our current concepts of life-death/immanence-transcendence and the very different view that characterised the archaic and faraway world of myth. After the dialogue between Thanatos and Apollo, a dark veil covers the scene. This cloud later disappears, swallowed by the Charonian stairway, to reveal the presence of the Chorus. The mournful pathos of the mythical events is enhanced by the singing of the female and male Choruses (the text indicates only a male Chorus), and is managed with intelligence and control by the director and actors, all of them excellent. The two characters in the prologue, Thanatos (Pietro Montandon) and Apollo (Massimo Nicolini), face each other in an ironic and mocking duel; the courageous Alcestis (Galatea Ranzi), not unlike a Homeric hero in her valour, is aware of her own aretè and does not indulge in querulous lamentations, maintaining instead a sorrowful but composed demeanour. Admetus (Danilo Nigrelli), regretting that he has accepted the sacrifice of his wife, calibrates his contradictory attitude, giving credibility to a character whose shifting thoughts make him difficult to define: his pained awareness of his own cowardice appears authentic. The cynical Pheres (Paolo Graziosi), the elderly father who did not want to die instead of his son, expresses with harsh firmness his contempt for Admetus without hiding his own irreducible selfishness. The female and male servants (Ludovica Modugno and Sergio Mancinelli), by contrast, display sincere affection and sympathy for their masters. The production also successfully calibrates and resolves the tension between tragedy and comedy that characterizes of the original work, which was staged at the Athenian contests in the fourth spot, traditionally reserved for satyr plays. Stefano Santospago skilfully portrays the complexity of Heracles, a gluttonous and unrestrained demigod who is also the generous restorer of Alcestis to life. He is at once hyperbolic and ironic, in a way consistent with the traditional iconography of the hero. Equal credit must be given to the music (varying with the text and reminiscent of folkloric motifs from southern Italy), and above all to Maria Pia Pattoni’s careful translation, which manages to reproduce, philologically but not slavishly, the original’s variety of stylistic registers: lyric, dramatic, pathetic, and sophistic, sprinkled throughout the entire tragedy, but reaching their antiphrastic climax in the satyresque tones of the epilogue. The ending is a parallel to the Christian funeral in the opening: as Heracles leaves for his next labour, he takes with him a club rather than a cross. This choice is a sign of convinced secularity, a worldliness that sees mankind’s abilities as a concrete chance of salvation. 1This review does not cover Seneca’s Phaedra, staged at the end of the 52nd season and directed by Carlo Cerciello. 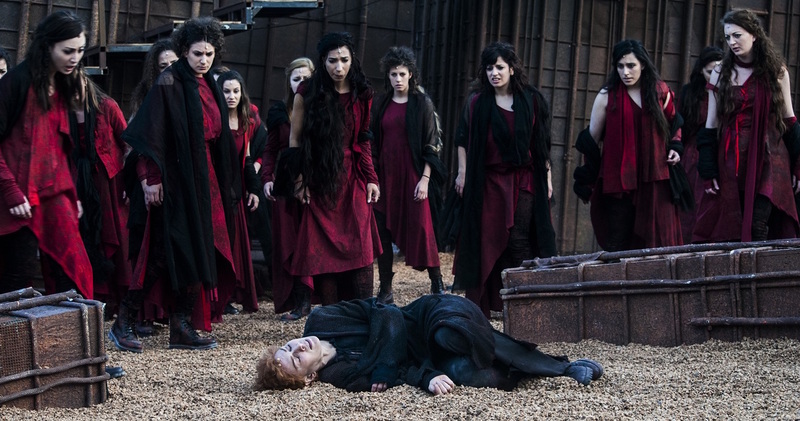 2Characters and cast: Electra: Federica Di Martino, Clytemnestra: Maddalena Crippa, Orestes: Jacopo Venturiero, Aegisthus: Maurizio Donadoni, Paedagogus: Massimo Venturiello, Chrysothemis: Pia Lanciotti, Pylades: Massimiliano Aceti, Coryphaea: Giulia Gallone, First members of the chorus: Simonetta Cartia, Flaminia Cuzzoli, Giovanna Guida, Giulia Modica, Alessandra Salamida, Chorus of Women of Mycenae: girls from the Academy of Ancient Drama, “Giusto Monaco” section, Masters of the Chorus: Francesca Della Monica and Ernani Maletta, set design: Alessandro Camera, costumes: Andrea Viotti, music: Giordano Corapi. 3Characters and cast: Alcestis: Galatea Ranzi, Admetus: Danilo Nigrelli, Heracles: Stefano Santospago, Apollo: Massimo Nicolini, Thanatos: Pietro Montandon, Pheres: Paolo Graziosi, Female servant: Ludovica Modugno, Male servant: Sergio Mancinelli, Choryphaei: Mauro Marino and Sergio Basile, Chorus of men: Nicasio Ruggero Catanese, Alessandro Aiello, Massimo Tuccitto, Lorenzo Falletti, Carlo Vitiello, Eumelus: Tancredi Di Marco, Alcestis’s daughter: Mirea Bramante, Choruses: boys from the Academy of Ancient Drama, “Giusto Monaco” section. The cast featured also students from the music program at the Corbino-Gargallo high school. Set design and costumes: Luigi Perego, music: Marcello Panni.